Increase sales and customer engagement with the help of web push notifications. It is now possible to achieve this, with the power of push notifications – for web browsers. Until now, building mobile apps was the only way to deliver push notifications and increase user engagement. 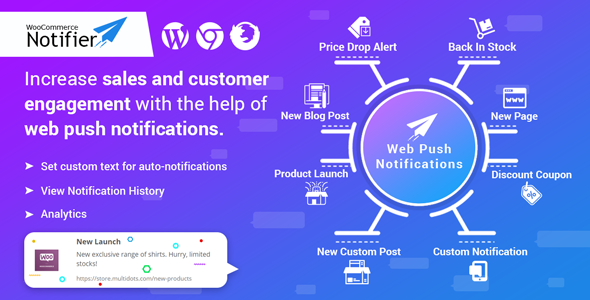 Once installed and configured, the plugin auto-sends push notifications to all users who have allowed web push notification for a WooCommerce store. Admin user can also send custom web push notification manually. NOTE: A valid SSL certificate is required to be installed on the website to send push notifications using this plugin.